Halifax Comedy Festival has magicked up a real gem for theatre lovers next week. The Festival has been successful in negotiating the rights for a regional premiere of “Matchbox Theatre” by internationally renowned playwright Michael Frayn. First performed at Hampstead Theatre, this is the first production outside of London of Frayn’s latest work and the Comedy Festival organisers are literally going to town on the production. Arriving at a local patisserie in Halifax, audience members, with coffee in hand, are treated to this comedic theatre piece which creates, according to Director Rob Marsden “portals into the past lives of the characters”. After a short scene, the audience and action move a short distance to the amazing Streets in the Sky, above Halifax Borough Market where the remainder of the performance takes place. Produced in association with Staffordshire University, the fresh and exciting professional staging of this production is a highlight of this year’s inaugural Comedy Festival which aims to put Halifax on the cultural map. Prospective audience members need to act quickly if they would like to secure a ticket however, as there are only four special performances with a maximum of only 20 tickets per performance available. For tickets and full details of the performance, call the Festival Box Office on 01422 305959 or 01422 351158. 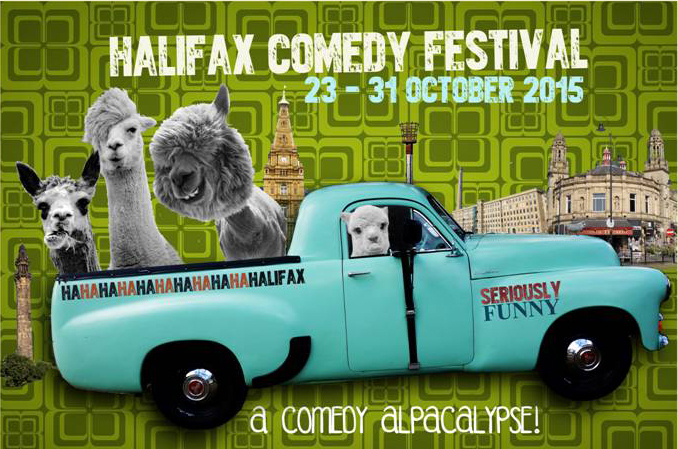 Matchbox Theatre is playing at Halifax Comedy Festival on Wednesday 28and Thursday 29October 2015 at 1pm and 5.30pm each day. Tickets for this prestigious event are only £7.50 and must be pre-booked. Audience members need to be able to be able to manage several flights of stairs in both venues. This entry was posted in Arts and culture, Tourism. Bookmark the permalink.